Rabindranath Tagore, the Bengali poet, playwright, songwriter, painter, educationalist, and philosopher (in a recent biography he was called “The Myriad Minded Man”) received the Nobel Prize in Literature in 1913. His books were translated into Swedish and for several decades thereafter Tagore was a famous name in Sweden, a country he visited twice, in 1921 and 1926. In recent years a renewed interest towards Rabindranath Tagore and his literary work has grown in Sweden, fuelled by new congenial translations of his poetry and songs from Bengali into English and Swedish. This program of music and literature highlights the life and works of one of the greatest personalities of the past 150 years (Rabindranath lived 1861–1941), and the relevance still inherent in his songs and his philosophy. 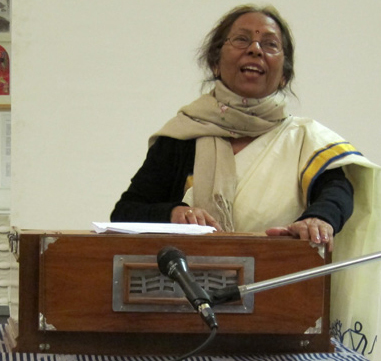 Bubu Munshi-Eklund is a professional singer, trained to sing Rabindranath Tagore’s songs at Rabindra Bharati University and Rabitirtha Institute in her native city Kolkata in India. 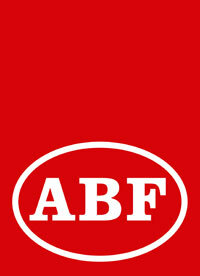 Trained by Suchitra Mitra and Kanika Bandyopadhyay. 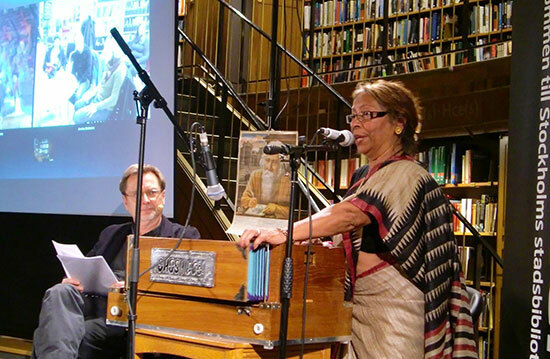 Since 1983, she is living in Lund, Sweden, but still regularly performing at rabindrasangheet concerts accompanying herself on the Harmonium. She has appeared on Swedish TV and radio, and sang in Lund Cathedral on the occasion of Mother Teresa’s death. Bubu is also the leader of Lund India Choir, consisting of Swedish singers specialised on singing Rabindrasangheet. They made a concert tour to India in November 2013, see report. More information about the choir. Per Olov Henricson lives in Stockholm and has pursued non-academic studies on Tagore. He has lived and worked in Bangladesh for some years, and has translated a number of Tagore’s poems into Swedish. During the programme, he deals with various aspects of his works and life, giving a personal account of reading the poetry in different English and Swedish translations. A special focus is put on the Nobel laureate’s role to connect the cultures of the East and the West, travelling to a large number of countries all over the World. This cultural program has been staged at several locations in Sweden, especially at libraries and museums, including a performance at The Nobel Museum in Stockholm in October 2002, an event attended by the then Ambassador of India to Sweden, Ms. Chitra Narayanan. In 2011, Bubu and PO performed in Lund during the Rabindranath Tagore 150th anniversary celebration week, held 20-24 March. More information. Bubu then also performed alone at the Tagore celebration event held at Uppsala University on 8 May 2011. This performance was attended by the Ambassadors from both Bangladesh and India, Mr. Gousal Azam Sarker and Mr. Ashok Sajjanhar respectively. More information. In connection with the commemoration of the 100th anniversary of Indian/Bengali Nobel Laureate Rabindranath Tagore receiving the Literature Prize in 1913, Stockholm Public Library (Stockholms stadsbibliotek) succesfully organised a Tagore programme on Monday 2 December 2013, at 18.00. Bubu Munshi Eklund, Achala Moulik, and Ambassador Banashri Bose Harrison. Per Olov Henricson gave a learned lecture on Tagore’s life and work, and reciting some beautiful poems in Swedish translatíon, and Bubu Munshi-Eklund sang his compositions in the original language Bengali. Listen to five songs performed by Bubu. The excellent video recording was made by Mr. Meah Mostafiz. The seminar was also transmitted via Skype to the libraries in Visby and Arvika. 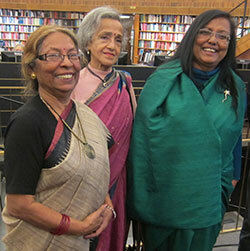 Indian Ambassador Banashri Bose Harrison participated and gave an inspired introductory talk, and Indian writer Achala Moulik from Shantiniketan, on a short visit to Sweden, talked about the Indo-Swedish connection that Tagore’s Nobel Prize came to initiate. Venue: Stockholm Public Library – designed by Swedish architect Gunnar Asplund, being one of the most notable structures in the Swedish capital – on Sveavägen 73. More information about the event. A cultural programme focusing on the 100th anniversary of Rabindranath Tagore’s Nobel Prize was held in Stockholm on Saturday 29 March 2014. The programme was jointly organised by Arbetarnas Bildningsförbund (ABF) and the Vox Pacis Ensemble, and featured lectures by Swedish Tagore specialists Olavi Hemmilä and Per Olov Henricsson, and vocal music by Bubu Munshi-Eklund, besides Shipra Nandy, Marie Kvernmo, Loten Namling and other members of Vox Pacis, led by its artistic director Gunilla Nordlund. More information. please contact Per Olov Henricson, or Bubu Munshi-Eklund.